This window is displayed when you choose the Compare Folders command from the Tools menu and select the internal comparer. You can use this window to compare the contents of the folders shown in the opposite panels. The results of the comparison are displayed by selecting the files and folders that match the comparison criteria you set. Displays the path to the folder currently opened in the active panel, as well as the type of the file system of the volume where the folder is located. This area also contains options that you can use to specify which files should be selected in the active panel after the comparison is done. Displays the path to the folder currently opened in the passive panel, as well as the type of the file system of the volume where the folder is located. 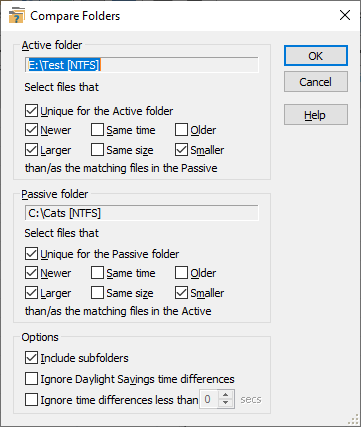 This area also contains options that you can use to specify which files should be selected in the passive panel after the comparison is done. If selected, this option makes AB Commander to compare the appropriate subfolders of the active and passive folders. If not selected, only files are compared. If selected, this option causes AB Commander to ignore the difference of exactly 3600 seconds (1 hour) in the last modification time of the files that have the same name and size and treat such files as if they have been modified at the same time. You may want to select this option if your computer is configured to adjust its clock automatically when entering and leaving the Daylight Savings time period. If selected, this option causes AB Commander to ignore the specified difference in the last modification time of the files that have the same name and size and treat such files as if they have been modified at the same time. You may want to use this option if you are storing the copies of the files on a server, and the server for some reason changes the last modification time of the files by a few seconds or a fraction of a second (servers do that in some cases, they probably have good reasons for that).